ITC is a leading supplier and distributor of proven, cost-effective surface protection products and solutions for the commercial, residential and retail sectors. CS Efflo Clean is a special high concentrate, biodegradable and environmentally friendly efflorescence cleaner, manufactured using unique plant extracts which contain NO hydrochloric or phosphoric acids in its make-up. CS Efflo-Clean is very simple to use, simply spray/saturate the efflorescence affected areas and wash off after several minutes. As the active ingredients already start to dissolve the white salt deposits and starts to run down, a wash with water completes the process. 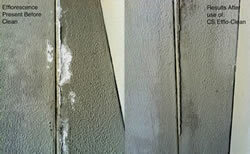 These hard, white, scaly or crusted deposits cannot be removed by simply water washing. 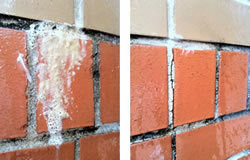 Treating the affected areas with CS Efflo-Clean, followed by high pressure water washing equipment works wonders for quickly and efficiently dissolving and breaking down efflorescence from beneath the surface of the substrate in minutes without the use of hydrochloric acids or similar harmful agents. A key factor when developing this product was keeping in mind surrounding plants and fauna particularly around building facades and pavers (walkways). This product is available for Project volume orders only. For more information, please contact us.